Cineworld is the UK’s number 1 cinema chain. With our cinemas across the UK showing a wide range of films – from big budget blockbusters to the best British indies – there's always something to thrill, chill or delight film fans of all ages at Cineworld. Please keep your eGift Voucher in a safe place, it is not replaceable if lost or stolen and the balance will not be returned to you. 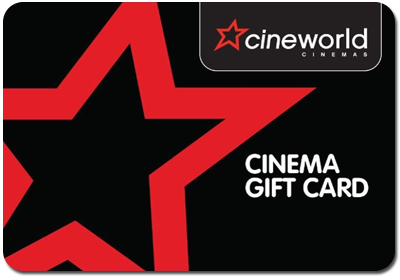 Your eGift Voucher can only be used online at www.cineworld.co.uk, the value on the eGift Voucher may be used towards payment for the purchase of cinema tickets (and any applicable booking/processing fees) and/or an Unlimited card. eGift Vouchers cannot be used to book tickets via the telephone booking line or purchases in any Cineworld Cinemas, nor used to purchase other eGift Voucher or Gift Cards. If using your eGift Voucher to purchase cinema tickets online, your tickets will be available for collection at your chosen cinema as soon as the booking has been confirmed, and remain available until the start of the selected performance. Simply take the same debit/credit card used to book your tickets, or the unique booking reference on your order confirmation, to collect your tickets from one of the ATMs (collection terminal) situated at the cinema or direct from the box office or concession counter. To make the most of your booking, we suggest that you collect your tickets 20 minutes before the performance commences. Tickets not collected 10 minutes after the performance time has started will be cancelled and are non-refundable. When you use the eGift Voucher, the amount of the Transaction Value will be deducted from the balance on the eGift Voucher. The remaining eGift Voucher balance will be displayed on screen and can be checked online at www.cineworld.co.uk. Where the value on the eGift Voucher is less than the total Transaction Value, you will be required to make up the difference in price, such payment will need to be by credit, debit, or charge card but may not be made using other eGift Vouchers. Your eGift Voucher does not entitle you to preferential treatment over other Cineworld customers at the cinemas or otherwise. eGift Vouchers cannot be exchanged wholly or partly for cash and may not be re-sold. eGift Vouchers are valid in the United Kingdom & Jersey only. Please note, you must redeem the full value of this eGift Code within 12 months of receipt. After this you’re your eGift Card will be invalid, it cannot be replaced or extended and any money remaining on it will be cancelled and will not be refunded. eGift Vouchers are subject to Cineworld’s terms and conditions available at www.cineworld.co.uk. Cineworld Cinemas Limited reserves the right to amend these terms and conditions at any time without notice.